Thank you so much Taylor B in the Parts Dept for the great service you gave me. Your attention to getting me what I needed so quickly and going the extra mile to get it shipped to me during the holiday season will be a memorable experience for me. Very rarely have I encountered such excellent service and I hope your employer knows what a great asset they have in you. Thank you again and HAPPY 2018 NEW YEAR!!! Yesterday I had yet another great experience with your dealership. I had to pull off of the expressway with a separated shifter linkage. All in all in less than 2 hours myself and the bike we picked up, taken to the dealership, my bike was fixed, and I was back on the road. Thank you for all that you do, it is greatly appreciated and does make a huge difference knowing you have excellent customer service. Thank You Chad Despones. This was a big purchase for me and you made it easy. Thanks for helping me get the Bike I have always wanted. 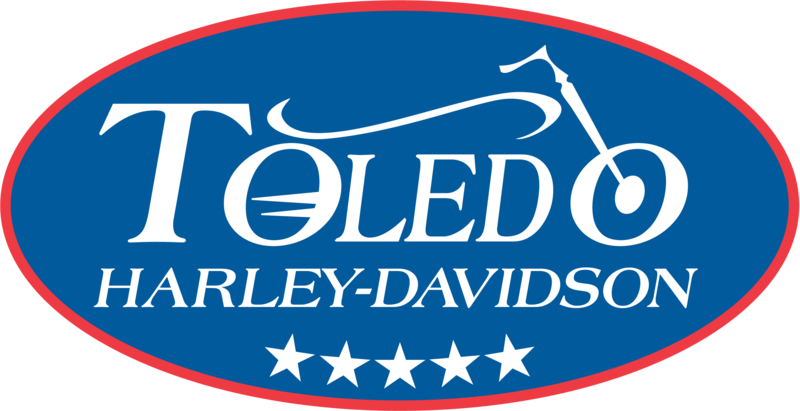 Ill be sure to give you and Toledo Harley Davidson nothing but good press and recommendations. Thanks again. While riding back to NY from Sturgis/Las Vegas/Colorado trip my primary chain tensioner was not working correctly. 3pm on a Saturday I stopped at Toledo H-D. Rolled out 90 minutes later! To all the folks in the service dept. you don't know how glad I was to have a problem near your dealership. Thanks for the fast service and getting me back on the road! Much appreciation!!! Could not have been handled any better! Friendly, courteous and knowledgeable staff. Service department is outstanding. Purchased my bike here and have it serviced here. Turn around time is very good and work performed is always first rate. Front desk staff very friendly and makes you feel welcome. I have recommended this dealer to friends and acquaintances." I just purchased my first Harley from Toledo H-D this past Saturday. Chad was a great sales rep. and there was no pressure from anyone. He even went on a test ride with me on a cool afternoon. The Finance Dept. worked with me and explained all the options I had. I am very excited about my new motorcycle and can not wait for warmer weather. Saturday night I was on my way back to New Jersey with a buddy of mine, we were making the long ride from Sturgis. As I crossed the Indiana Ohio border my clutch went out. Finally got the bike towed to your dealership around 9:30PM that night and as luck would have it Rick and the HOG chapter were still there! He was able to move my bike inside for the night and then gave me a ride to a hotel! The next morning Jaci had my bike checked and it was a simple fix and I was back on the road by noon. The people at your dealership were so nice and helpful what a great experience. Harley Davidson riders truly are a community. Rick, thank you for all your help. You made what could have been a bad experience into a great story. Thanks again, Gene Murphy 2008 Road King Classic. We had a flat tire July 28th on Freeway 23, and the dealership had someone come and get us and we got a new tire. Everyone was very nice to us. Thank you." Everyone we came in contact with while we were purchasing a motorcycle were very friendly and helpful. They took extensive time to make sure we had what we needed to be safe and weren't being pushy about selling us stuff we didn't want." Just a note to thank everyone at the dealership for their help in my recent purchase of a new Harley-Davidson. Your friendliness and help are greatly appreciated. Cam was great and the gentleman that did the cycle delivery was professional and helpful. Thanks again and keep up the great work. My wife and I had a great experience from the start.When we arrived at the dealership, we were greeted by our salesman Chad and the sales manager Jerry. We shook both of their hands and then we went on the H-D of Toledo path. We toured the whole place and met the whole staff. Everyone in this place was very professional. This dealership is the best in our minds. Everyone is very informed about their product. If I could I would give Toledo Harley a 10 rating. The people at Toledo H-D made us feel like part of the family. We are looking forward to going to all of the events at this dealership and at Signature H-D of Toledo this summer and upcoming years.